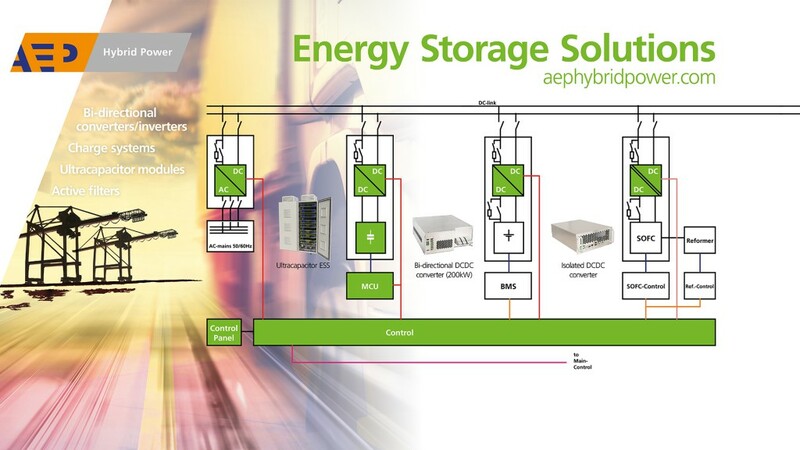 AEP Hybrid Power is innovative in energy storage and power electronics. We supply unique Ultracapacitor cells, energy storage modules, chargers, converters and systems. We are also heavily involved in the design, development and system integration of custom-made solutions. We enable our customers to focus on their core business by offering them a complete solution - from control & monitoring software and power electronics (such as converters) right through to housing, connection and mounting options. We use our expertise to offer custom-made modules that meet even the most challenging requirements. The excellent volume / weight ratio of our modules makes them ideal for compact systems. Ultracapacitors have a very high efficiency (up to 98%), an extremely long lifetime (± 10 years) and they are virtually maintenance free. Ultracapacitors perform under the most extreme temperatures (-40°C to +65°C) making them suitable for many applications such as industry, heavy lifting, heavy transport, telecommunication, medical and aviation. AEP Hybrid Power is a productline of AEP International, the global supplier of electronic components, systems and tooling. For over 35 years we support maritime, medical, railway, aerospace and many other industries. In episode 4, Business Tips visits AEP Hybrid Power at the Electric & Hybrid Marine Expo. In this TV-item Johan and Peter are telling you more about the technology, the products and the total solutions of AEP Hybrid Power. Curious what we can do for you? Please let us..